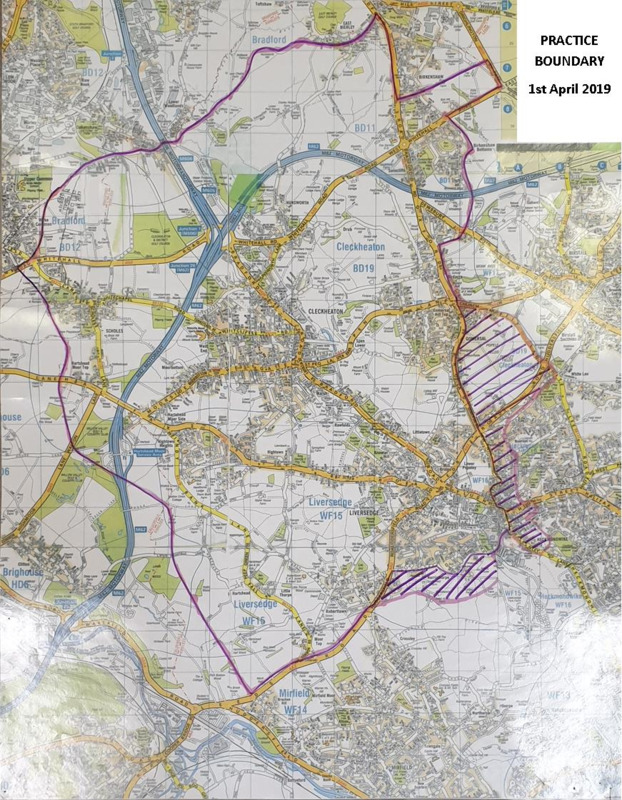 In consultation with our Patient Participation Group and the North Kirklees Clinical Commissioning Group, our boundary map changed on 1st April 2019. We no longer accept registrations from patients living in the shaded are shown on the map below. Any patients already registered with us and living in the shaded area will continue to be registered until such a time that they move out of the new boundary area. This map is also displayed in the patient waiting room. If you wish to pre-register click on the link below to open the form. When you have completed all of the details, click on the "Send" button to mail your form to us. When you visit the surgery for the first time you will be asked to sign the form to confirm that the details are correct. Please note that you MUST attend surgery within one week of completing the online forms or they will be destroyed.